Ron Colonna's 1/4 scale 270 Offenhauser 4-cylinder engine takes model engineering to the highest level because Ron has not only built the engine, he has also documented it in a book with plans so that others can benefit from his experience and built it too. This is the type of model engineering you will see in this section. 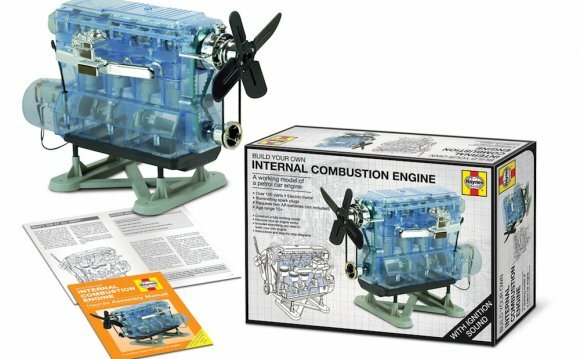 Building a running internal combustion engine in a small scale is one of the tougher projects you can take on in model engineering. As engines get smaller, tolerances must be tighter, and some things like the size of air and fuel molecules and electricity just don't scale. A certain amount of cleverness is required to get all these elements to work together. Some parts can be scaled exactly and some must be adapted to work at a small size. The trick is knowing which ones and how much. If you would like to get involved in a group project to build an internal combustion engine, see our SEAL ENGINE PROJECT page. To see and hear an assortment of model engines being run, see our RUNNING ENGINES links. If you have additional information on a project or builder shown on this site that your would like We also welcome new contributions. Please see our page at a submission form and guidelines for submitting descriptive copy and photos for a new project. manufacturers of tabletop machine tools and accessories. Steven Charles Manthey (born February 16, 1961) is an Australian born inventor who conducts research in the field of internal combustion engines. Philippe le Bon (or Lebon) (D'Humbersin) (May 29, 1767 – December 1, 1804) was a French engineer, born in Brachay, France.